Freddie Gray protests: Baltimore cops assaulted with bricks and rocks as mass action turns violent. 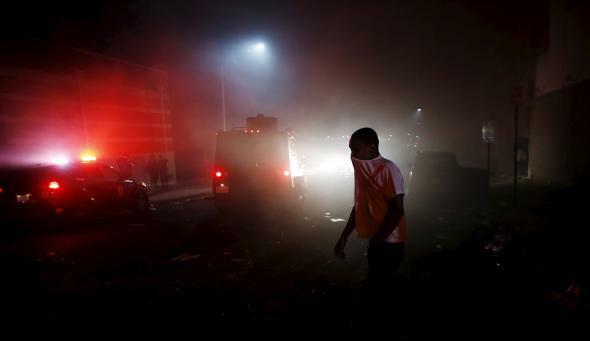 A protester walks through the smoke of burning Baltimore buildings during clashes. Hours after the funeral of Freddie Gray, the Baltimore man who died while in police custody earlier this month, the Baltimore police department reported that its officers had been attacked by a “group of disorderly individuals” throwing rocks and bricks near Mondawmin Mall in Northwest Baltimore on Monday. The situation is continuing to unfold; you’ll find updates below and complete coverage here. 10:50 p.m.: On Tuesday Baltimore city schools will be closed, a curfew will be imposed, and the National Guard appears set to be on the ground to help patrol the streets of Baltimore. 10:08 p.m.: For more context on the geography of the city in relation to the ongoing unrest, the New York Times maps the day’s chaos in Baltimore. 9:48 p.m.: Baltimore City Public Schools closed on Tuesday. 9:13 p.m.: A massive fire breaks out in East Baltimore, it remains unclear if related to unrest. 8:44 p.m.: Police tell the Associated Press that 15 officers have been injured during Monday’s violence and two have been hospitalized. More than a dozen people have been arrested. 8:12 p.m.: Reports of looting continue. 7:51 p.m.: Local news footage from earlier in the day shows police vehicles getting pelted with rocks. 7:05 p.m.: State of emergency declared. 6:21 p.m.: Orioles game is postponed as Maryland Governor Larry Hogan puts National Guard on alert. 5:43 p.m.: The situation appears to be growing slowly more chaotic. Several cars—police and otherwise—have been set ablaze throughout the afternoon. A CVS was one of the first businesses that appears to have been looted. A portion of the crowd has since shifted its attention to a check-cashing store. 4:46 p.m.: Baltimore Sun reporter Erica Green, who is on the scene, said that one officer appeared to be badly hurt. According to a widely circulated flier, a high school “purge” was to take place at 3 p.m., starting at Mondawmin Mall and ending downtown. Such memes have been known to circulate regularly among city school students, based on a film “The Purge,” about what would happen if all laws were suspended. The flier included an image of protesters smashing the windshield of a police car Saturday during a march spurred by the death of Freddie Gray, a 25-year-old man who suffered a spinal cord injury earlier this month after being arrested by city police.